Bangalore: MVJ College of Engineering, well known for its quality education and excellence ranked among the top engineering college in India is organizing an award ceremony at the MVJCE seminar Hall Whitefield to felicitate 3 Gold medallists and 14 rank holders who have topped VTU results for the year 2017. The ceremony was preceded in the presence of Dr. V. Bhujanga Rao, a Distinguished Scientist, ISRO Chair-Professor, National Institute of Advanced Studies, IISC campus Bangalore, and Director General (Naval Systems and materials) DRDO (ministry of Defence) New Delhi. On this occasion MVJCE chairman Mr. M. J. Balachandar announced that the rank Holder students (17 No’s) in the VTU board examination results will be receiving a cash prize of Rs. 1 Lakh, for each of the UG course and Rs. 50,000 for the M. Tech course on the founder’s day, which has been the regular practise over the years. The 3 students who have secured gold medal in the university rankings are Joyce Mathew, B. E., Department of Medical Electronics. Nagaraj Naik B G, M. Tech, Department of Aeronautical Engineering and Nandikeshwar Sulegoan, M. Tech (Transportation and Engineering). 14 rank holders have received a certificate and a memento in recognition to their academic excellence. 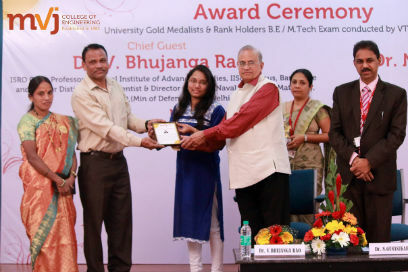 Speaking on the occasion chief Guest Dr. V. Bhujanga Rao Said I understand that lot of students have received Gold Medals on the Merit, of excellence in their B.E., M. Tech Examinations. “Marks and credits along with Knowledge is the passport for Success, never think Education is over. Learning is a continuous process, fortunately today all the materials are available at your doorstep through the Internet, utilise this opportunity to the best of your ability”. Apart from knowledge, hard work is the key to success. It is important for students to set up serious Goals, plan to achieve through time management. Another important aspect for success is leadership qualities. Principal MVJCE Dr. N Gunasekaran was immensely pleased and mentioned “I congratulate all the students who secured the rank leaving a benchmark to be achieved for the next batch. To achieve anything, not only the student- the faculty too has to come out of their comfort Zone, work with focus towards the achievement. The management has promoted the development of the students by providing them very good infrastructure and motivation through such laurels. The institution has consistently secured 4th place in UG program, 6th rank in PG VTU results”.